Crazy. Say it out loud. C-r-a-z-y. Easy, right? Conceiving then birthing the Laminar Streamer whose 6-year gestation period exceeded even the two years of elephants meant doing the crazy. 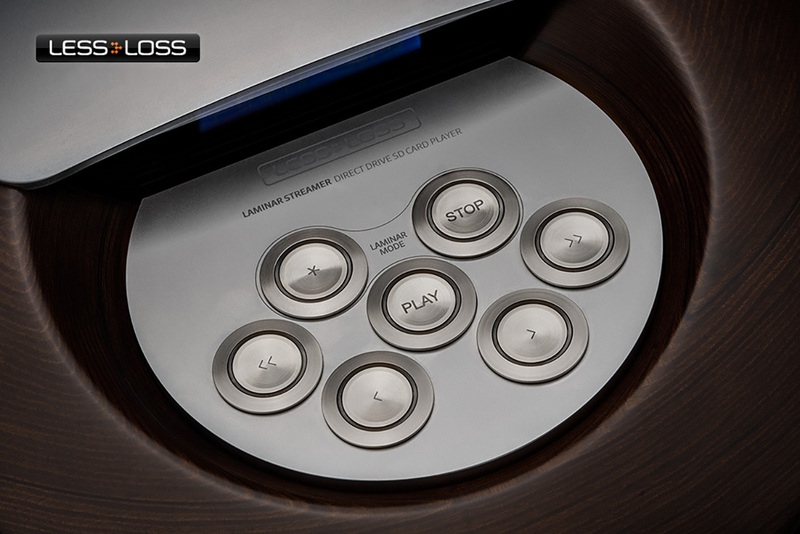 With what at the time of writing was the one and only unit in existence, LessLoss contained the amount of crazy they had already invested until the first audiophile extremists took note to place orders. What is a laminar streamer, you ask? A properly unreasonable product all around; an SD card transport. That's it. Forget a built-in DAC, big display or HDMI output. "When you put an SD card into any mass-produced laptop, you can do a full-screen view. That is never going to happen from within the engine of our Direct Drive OS. Direct Drive OS, as you will easily hear, kills multi-tasking computers when it comes to sound quality. Otherwise we would never have bothered. So, no screen. Better yet, switch to Laminar Mode to completely disengage location tracking and all power to our small display. Then you have 3am sound at 3pm." I told you. Crazy! 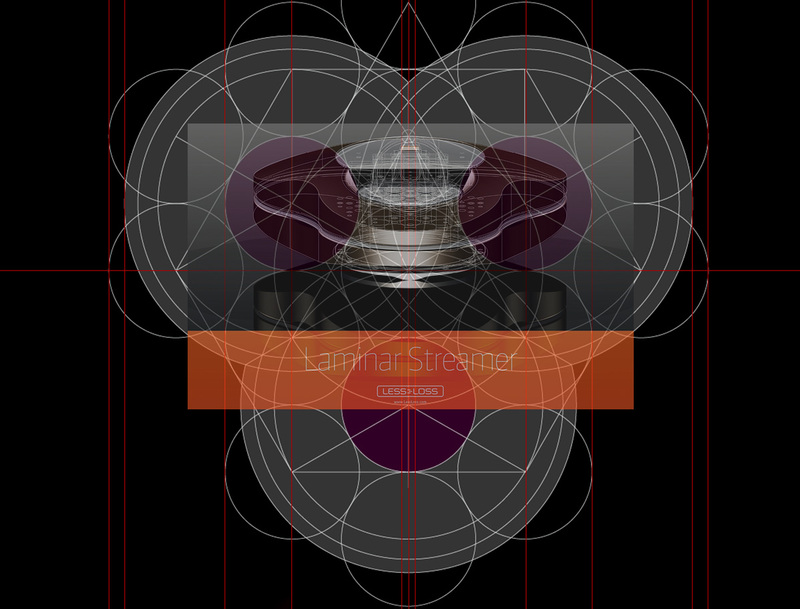 Early design concept based on three interlocking circles. With my astrological chart's six moons in Aquarius, it's of course why it had my full attention. From PureMusic to JPlay, from Audirvana to JRiver Media Center, software players that bypass an operating system's generic sound engine all go to certain lengths to disable computing threads and programs which load down your CPU yet do nothing for the actual audio. What if we could eliminate the massively paralleling OS altogether? Whilst cleaning out that attic, how about dumping the computer's noisy switch-mode power supply? Its high refresh-rate display? Its fans? Its hard drives? Heck, why not the entire computer while we're at it? Burn down the house. Such an uncompromising quest was at the heart of the Laminar Streamer. It dismissed even 'audiophile' streamers for still being nothing but repurposed computers. If one meant to transcend the breed entirely, what actually would be left to stream audio with? Get out your calculator. Start subtracting away. The one closest to zero wins. In the imagination of one Liudas Motekaitis—Louis Motek to those outside Lithuania—the perfect streamer would use the most barely-there operating system. G-string code. It'd boot up in 1/5th of a second with no buffering or syncing. There'd be no latency or compatibility issues. Ever. Without WiFi or Ethernet, there'd be no susceptibility to computer viruses. Not even an SD-card-carried infection would recognize LessLoss' 1'500 lines of 82KB Direct Drive code. No Trojanware could infiltrate and run itself. Then there'd be no moving parts. Period. Just so, there'd be heroic resonance control by way of a massive Panzerholz enclosure with steel divider for the power supply. There'd be 24/192kHz file support for .wav/Windows and .aiff/iOS files. A single precision clock would pair the data to his proprietary Direct Drive OS, then spit out pure digital data via coax, AES/EBU or I²S on 5-pin connector. His perfect data carrier? The FAT32-formatted SD card. Smaller than a postage stamp, 512GB cards are already available but likely overkill if one wants to keep navigation sane. 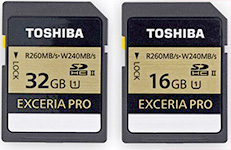 LessLoss in fact recommend Toshiba Exceria Pro 16/32GB cards as the best-sounding option. Ensconced in a 24kg flying saucer enclosure of 42.3x40x16cm, this LessLoss is audiophilia's UFO alien; the golden discus of the gods. At €91'181, prospective owners will be god-like. Pulling a Gilgamesh, I'd live well beyond my station for a while. I'd sample a massive dose of crazy just to see what's possible when all shackles of rhyme and reason drop away. So... the Laminar Streamer is what happened on the desert road of digital minimalism toward the Promised Land. Again, this machine is nothing but a digital transport. Those who believe that digital cables sound the same; that 1s and 0s couldn't care less whether they're read off a laptop's wobbly DVD reader, top-drawer Esoteric sled, Samsung HDD or Sandisk SSD... they will simply shake their heads at this outrageous notion embedded in a composite slab. To me, it made perfect sense. And with just one unit in existence, the out-there pricing was really immaterial. Until LessLoss decided to go into formal production with secured orders, this was just proof of concept. 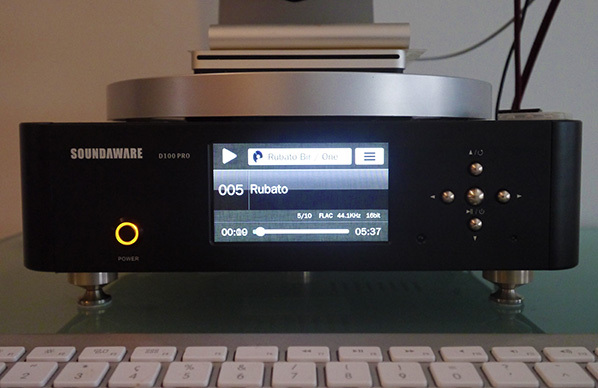 My curiosity was whether in practice, its extremism would net a demonstrable lead over my usual SSD-buffered stream off our PureMusic'd iMac; and the $1'279 Soundaware D100 Pro Deluxe, an SD card transport from the PRC with remote control. Streaming identical files, one playlist on the Mac, the other dragged 'n' dropped to SD card, the first hoofing it onto the DAC via USB, the second via AES/EBU or coax, it'd be pray tell. If the laminar lead was as Louis claimed, what exactly would it demonstrate? On what audible aspects would it improve? For cynics, the entire concept is a bitter placebo pill. Digital doesn't suffer a turntable's speed instability nor its alignment variables of tonearm and cartridge, vertical tracking angle/force & Co. With any bit-perfect receipt of the binary code and a properly clocked DAC, why should a digital transport matter? That's why there's only the smallest of displays which we're still advised should be bypassed in 'laminar mode' for best results. That's why there's no on/off switch. That's why this completely overbuilt crazy thing does only one thing; but purports to do that thing more perfectly than anything else: stream digital data off an SD card to a DAC of your choice. Do you feel hoodwinked yet; or intrigued instead? Go here for another Chinese $649 everyman option with its own custom code. Ming Da and Dugood have their takes on the subject. 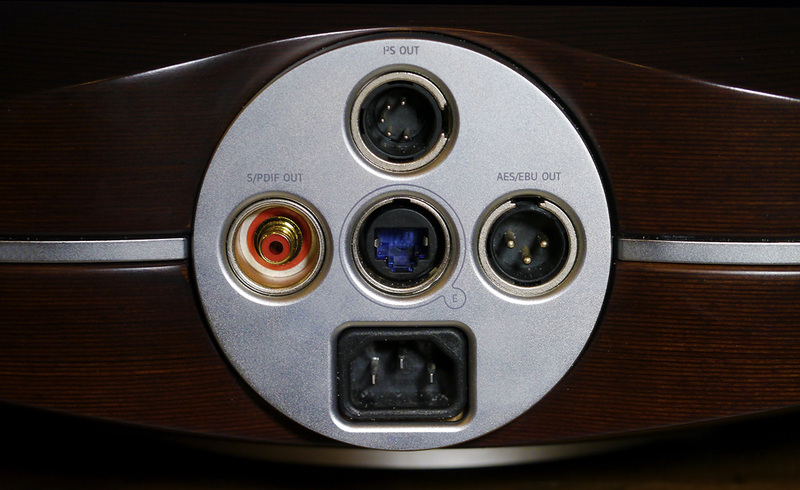 For even less ambitious use of purely MP3, there's the Media Box S from Pro-Ject's Box Design division. The concept is alive in the Far East, in the low end and with cheap DJ/pro machines like Denon but has been peculiarly absent in our ultra High End. Until now.